Looking forward to The Dark Knight Rises? You're not alone. In fact, some of us are already planning to buy the inevitable DVD and/or Blu-Ray trilogy. What would the box cover art for the Ultimate Dark Knight Trilogy look like? 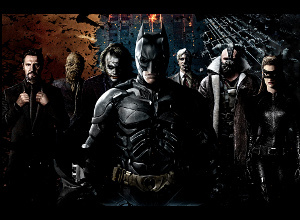 Awesome artist Messenjahmatt has created this preview, featuring the villains of all three movies. What do you think of the poster? Would you buy the trilogy? It looks great. My hubby won't even let me have 'that Harry Potter crap' up, so I don't buy posters, but I do really love it. 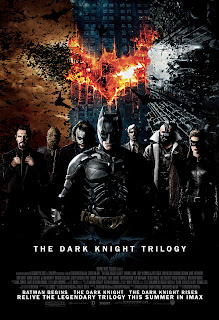 I wouldn't buy a trilogy set of DVDs since I already have the first two but that is a pretty cool poster.